On our drive back to Maine from Canada, we made a split-second decision to cut out our next stop and go back to Maine a few days earlier than we had originally planned. Part of the reason was the bad weather, but another big reason was because we had so many friends that were there! So we drove a few extra hours, and the next night had a great time catching up with good friends Robin and Jeremy from Live, Breathe, Move, Tim and Amanda from Watsons Wander, and Nancy & Besty from RVaGoGo. There’s nothing better than a great gathering of friends. Well maybe just one thing better – a great gathering of friends where there’s also great food! We had a taco cook out one night at Tim & Amanda’s Airstream. We’ve got some great cooks in our circle of friends! The tacos were delicious and so were Robin’s margaritas. After a few days Tim & Amanda had to move on so we had to say good-bye to them. 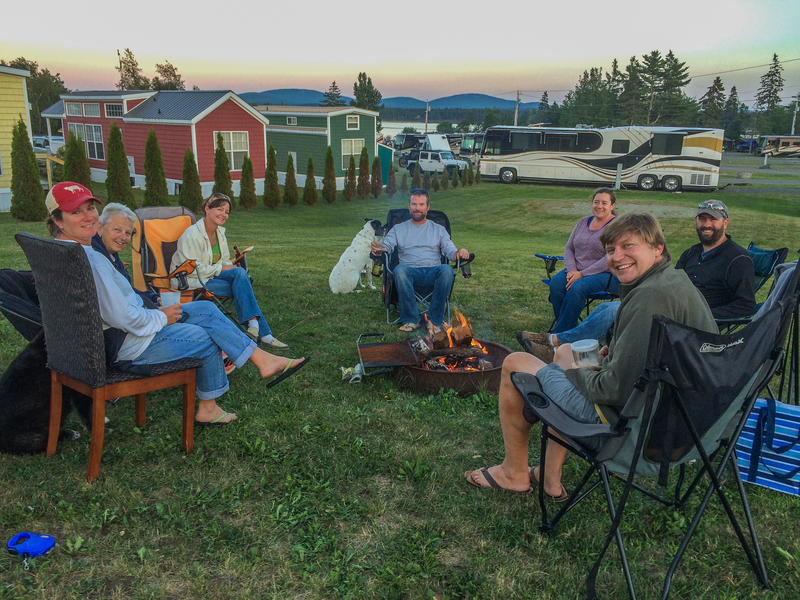 A couple of weeks later our friends Don and Gail from Winecoasters Blog came to Bar Harbor also. We had lots of fun times with them, including a lobster cookout, a fabulous dinner at Havana, and an Art Walk in downtown complete with chocolate and orange creamsicle martinis. 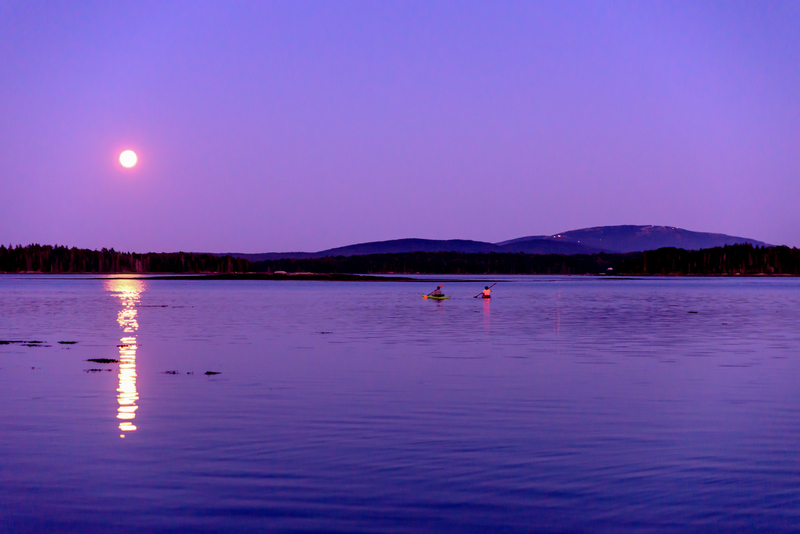 One night during our stay there was a beautiful full moon, and Deas and I watched with envy as these two lucky people headed out for a late night kayak ride under the light of the moon. In between all the socializing and kayaking, we did manage to get in some more hiking and exploring. 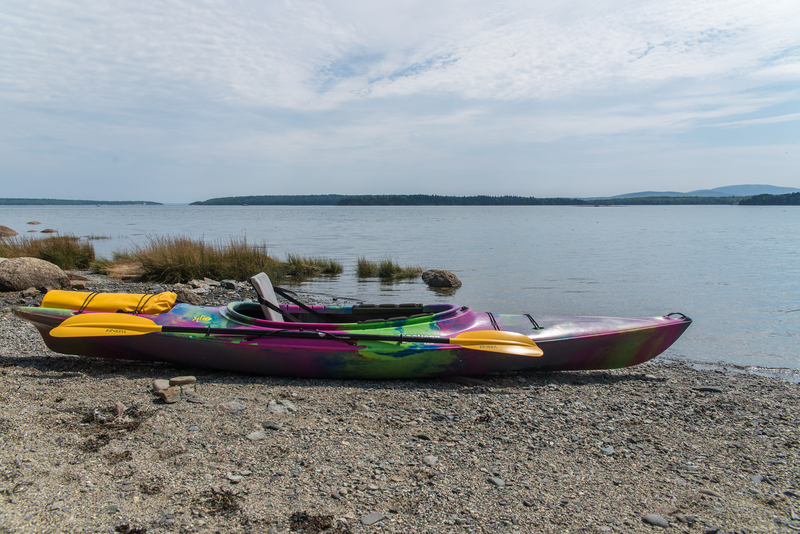 There is an easy hike in Bar Harbor out to Bar Island that is only accessible for 3-4 hours each day around low tide. I really wanted to do this hike as we heard it gave you a great view looking back towards town. Unfortunately on the day we chose to do this hike, this is all we saw. 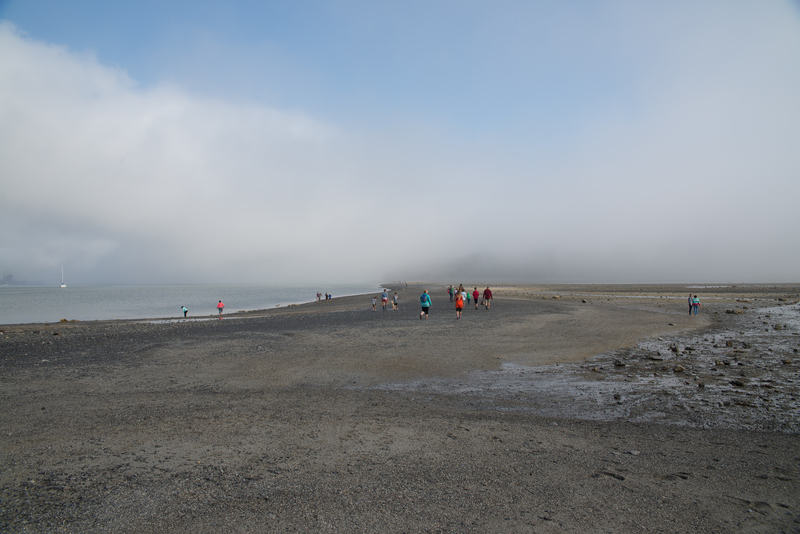 We hoped the fog would burn off, but alas – no such luck. 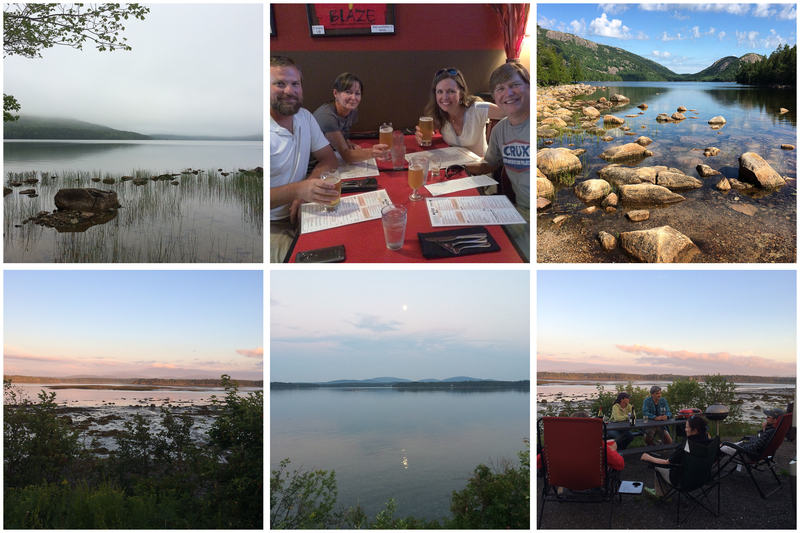 We did a little exploring outside of Bar Harbor, including a day trip over to the Schoodic area of Acadia, which is about 30 minutes further east down the coast. It’s a beautiful area, and they just opened up a new campground there that we heard is beautiful. 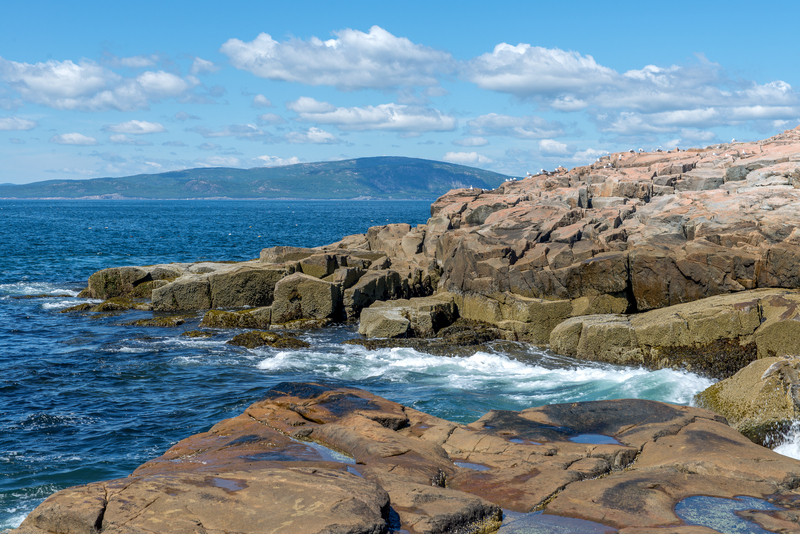 There’s really not a whole lot of hiking in Schoodic, but it is worth a day trip just to see the area. 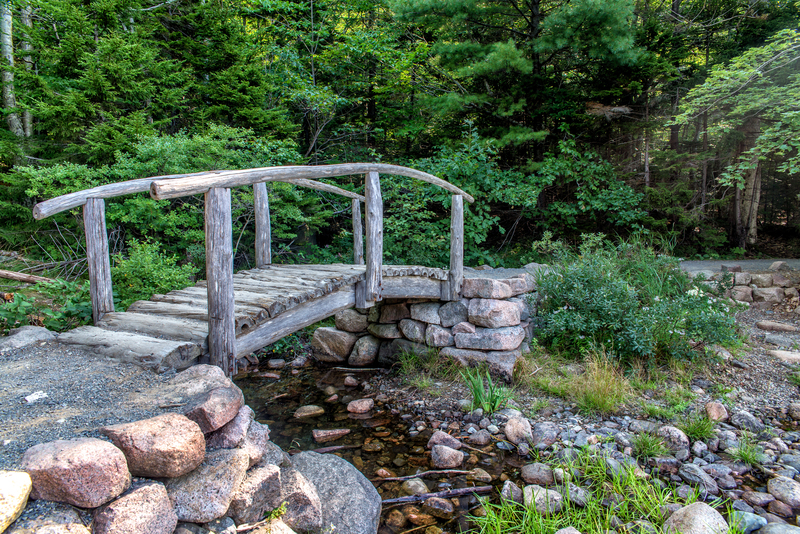 And we did one last hike around Jordan Pond with Nancy and Betsy, and then had popovers at the Jordan Pond House. We had such a great summer in Maine. But alas it was finally time for us to move on. We will definitely come back to Maine again sometime soon! Yes, I think the only question for us is whether we go back next year…or wait until 2017! Congrats on the kayak, Deas! 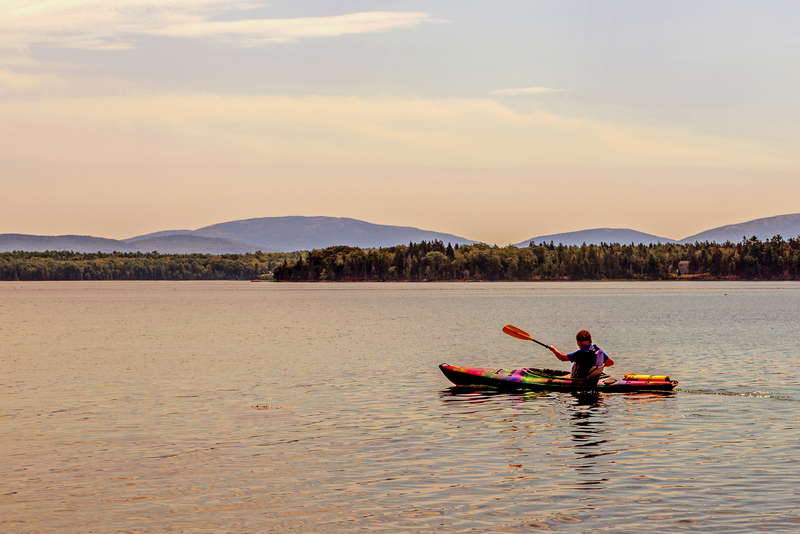 I’ve only kayaked a couple of times and loved it. Thanks to both of you for the great photos and narrative of Maine. We just may definitely have to go! You definitely should go! It’s definitely now on our list of favorite places. Your photos really do make me sad that we didn’t make it up there last year. Although this year would have been better with all of you! Oh well, someday. Maybe you can whenever we go back…not sure when that will be, but we’re definitely going back! Next Next post: Providence Canyon State Park – in Georgia!